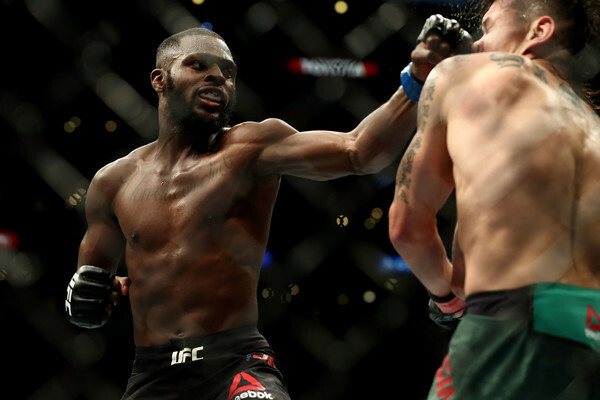 UFC Fight Night 125 played host to one of the most dominant performances in recent memory at the hands of Valentina Shevchenko, who sailed to a second round rear-naked choke in her flyweight debut. 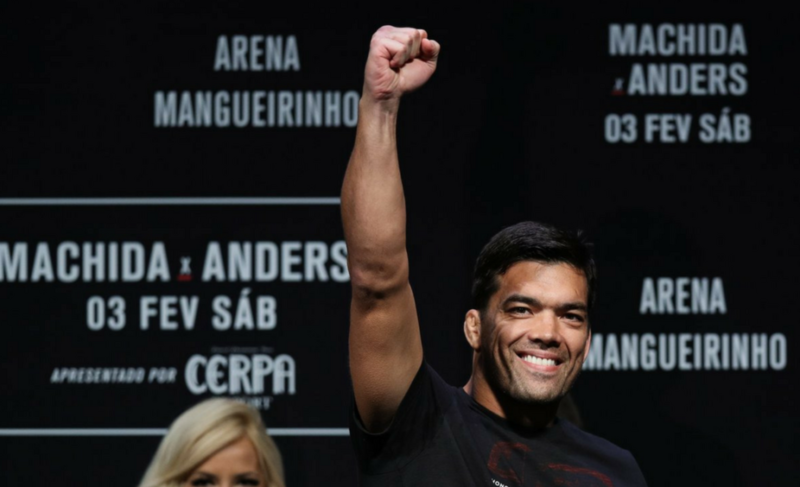 The fight was tainted by another unsavory display of refereeing by Mario Yamasaki (who’s officiating has been described by Dana White as “scary” and “incompetent”), but that will not matter for “The Bullet”, who will now surely return to the main event slot in her next outing. The chasm in ability between the two women was immediately apparent as Shevchenko opened with a stiff counter jab and then sent Cachoeira on the back foot just moments later with a crisp left hand that clearly stunned her. Shevchenko, dropping down to the newly opened 125lb division after her second loss to Amanda Nunes at UFC 215, then began teeing off on the UFC newcomer Cachoeira with a barrage of punches and a wicked kick to the liver. That 40 seconds of hell was all that round one would see on the feet, though, as Shevchenko ducked under a poorly timed punch to drive through with a trip and land in her opponent’s guard. 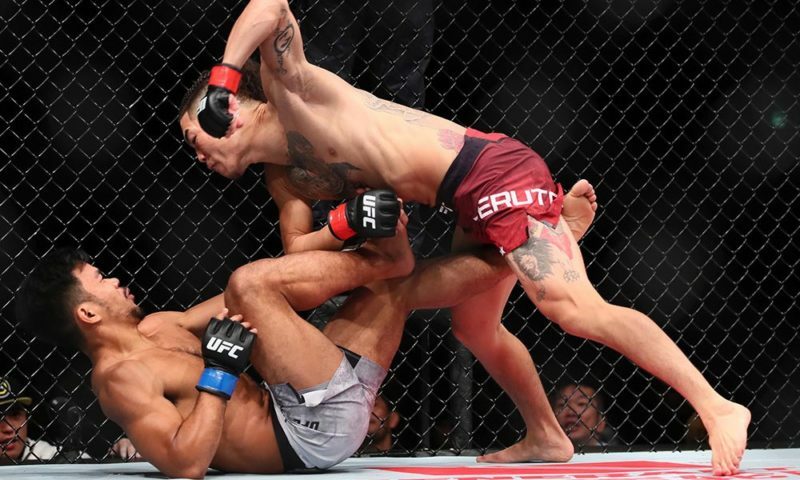 It was here that Yamasaki’s capabilities would first be called into question as the previously undefeated Cachoeira’s face became a crimson mask during the remainder of the round. An array of truly terrifying elbows from Shevchenko warranted Yamasaki’s intervention, and yet the bout was allowed to continue until the klaxon sounded for the end of the first five minutes. 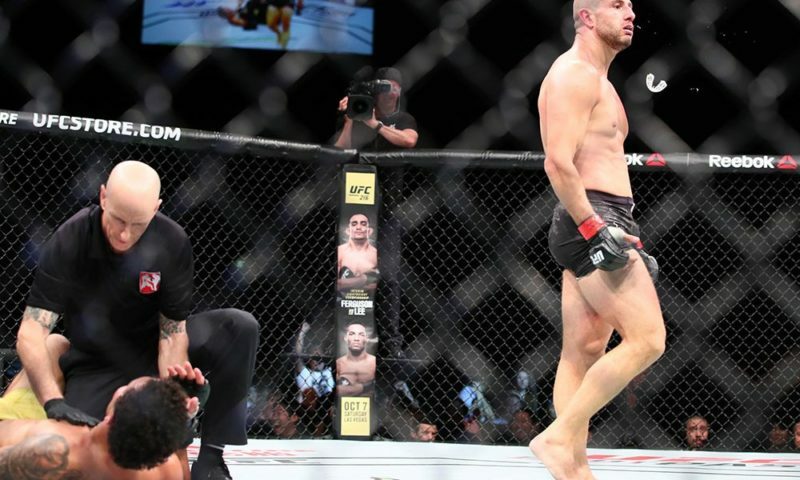 It was a hard-to-watch exhibition of brutality from the 29-year-old Shevchenko, and one that should not have been prolonged to the extent that it was. Nevertheless, both fighters returned to their stools and readied themselves for the second round. 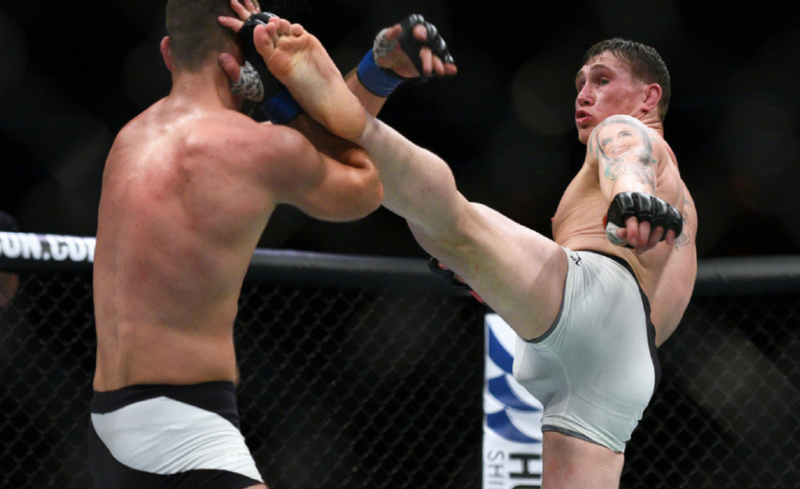 No fighter can ever be discounted in MMA, but it was plain to see where this one was going. The second round was more of the same as Shevchenko wasted no time in getting the contest back to the mat, landing a trip with little resistance within 15 seconds. There was a slight struggle from Cachoeira to get out from underneath her opponent, but her fate was ultimately sealed when Shevchenko clamped down and adjusted to get to side control. With an incredibly underestimated ground game that has submitted Juliana Pena in the past, “The Bullet” pinned Cachoeira’s arm to the mat and moved into the crucifix position. With only her right arm free to fight back, the Brazilian was defenseless and Shevchenko punished her accordingly, landing hard right hands before returning to the razor-sharp elbows that brought her so much success – and blood – in the first round. Once again, the fight could have easily been stopped here, and yet Yamasaki’s only move was to tell Shevchenko to avoid the back of the head. 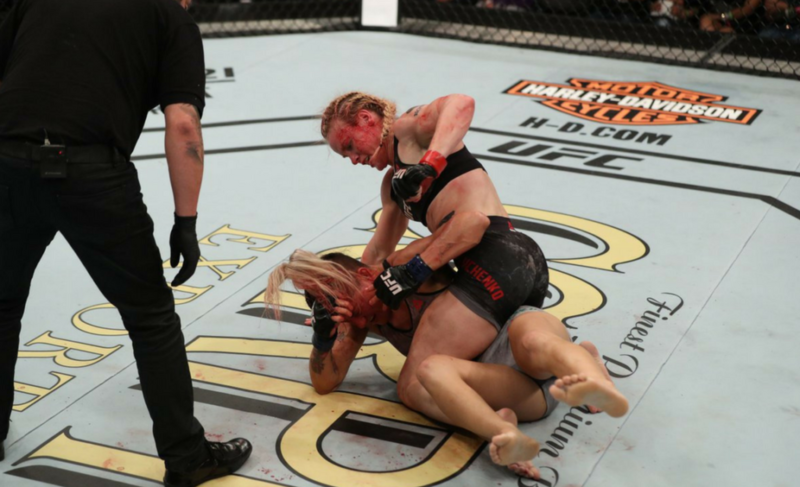 Shevchenko realized, perhaps, that the only way to bring an end to the bout was to get Cachoeira to give in herself, and so shifted her attention to an Americana on the beaten-up 29-year-old’s left arm. Unable to get it, Shevchenko kept up her incessant ferocity by once again smashing Cachoeira’s face in a fashion only previously seen from the likes of Khabib Nurmagomedov and Daniel Cormier. Her opponent now a bloody and dazed mess, the Kyrgyzstani-Peruvian warrior slipped into full mount and unleashed a bombardment of punches that, to the dismay and anger of many, did not compel Yamasaki to step in and stop the fight. Fortunately, Cachoeira’s steely mentality finally gave way to the finish as she gave up her back and, after taking another unsettling onslaught of punches, was forced to tap to Shevchenko’s rear naked choke. 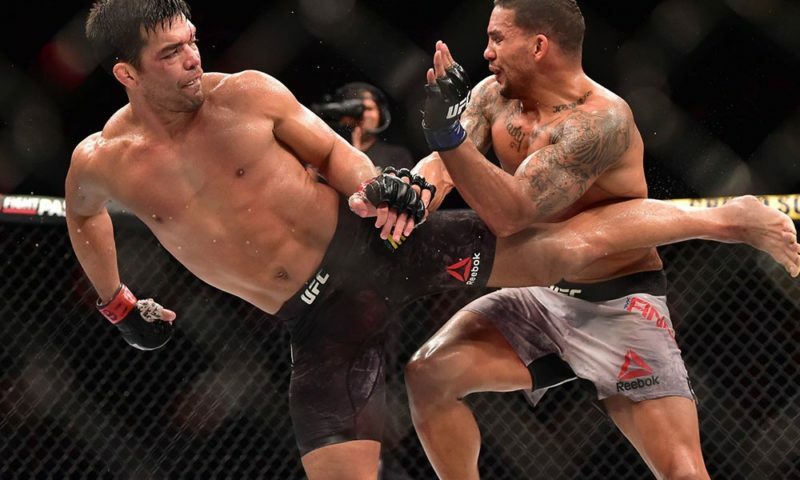 Yamasaki even managed to squeeze in another example of his inexplicable refereeing as he missed Cachoeira’s first tap, condemning her to a few more seconds of unnecessary punishment. 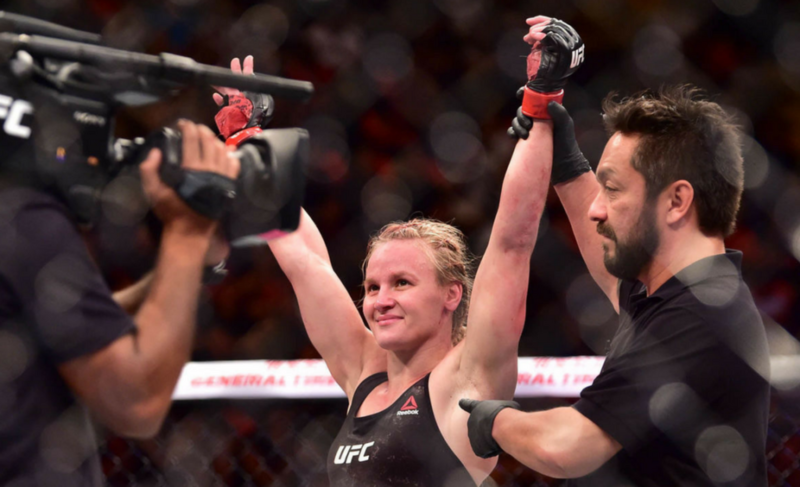 Whilst Mario Yamasaki will undoubtedly grab his own headlines, we cannot let his inadequacies as a referee overshadow Valentina Shevchenko’s impressive performance. Say what you will about Priscila Cachoeira, she was a game, undefeated prospect fighting in front of a home crowd; she provided a unique challenge for Shevchenko, a challenge that she passed with flying colors. She looked just that little bit faster on the feet, and clearly had an immense advantage in the strength department. She looks to be the perfect mold for a flyweight. The women’s 125lb division was long thought to be an intriguing idea, and that intrigue has turned into excitement after Shevchenko’s win. With so many strawweights and bantamweights likely to flock to the new weight class (including a certain Joanna Jedrzejczyk), the possibilities for matchups is almost infinite. 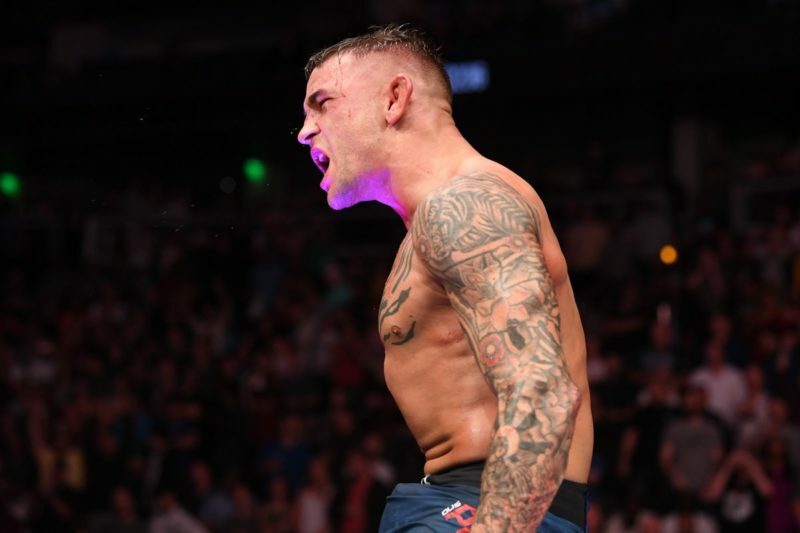 Whether she waits for the champion Nicco Montano to recover or faces another top contender remains to be seen, but one thing is for sure: this bullet is going straight towards the gold.